The 2018 drilling program (13 holes totalling 1,484 meters) was conducted in the northwest region of the Keymet property. Eleven drill holes (Ky-18-10 to Ky-18-18, Ky-18-21 and Ky-18-22) tested the Elmtree 12 vein system as in-fill drilling and along strike with some holes testing deeper than previous drilling. Company management speculate the Elmtree 12 vein system to be striking approximately north-south and sub-vertical. 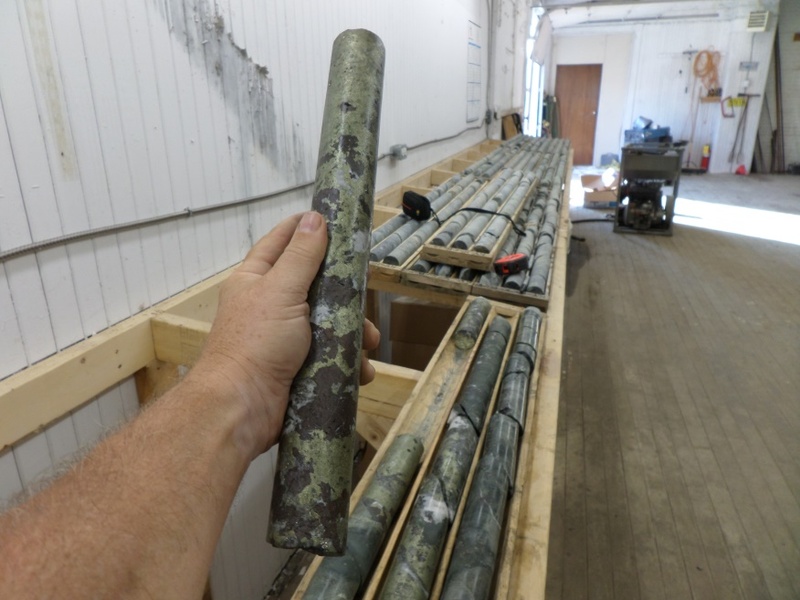 Great Atlantic had previously drilled six holes in the Elmtree 12 vein system during 2015 and 2017, intersecting zinc, copper, lead and silver bearing polymetallic veins (News Releases of February 23, 2016, December 20, 2017 and March 2, 2018). Two drill holes (Ky-18-19 and Ky-18-20) tested the continuation of another base metal and silver bearing vein southwest of the Elmtree 12 vein system. 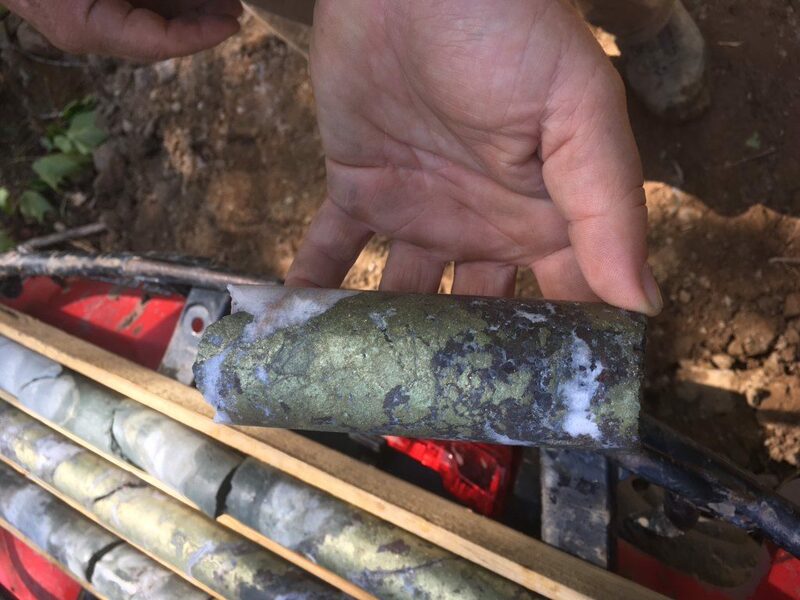 This vein was discovered during 2017 drilling (Ky-17-8: 18.8% Zn, 3.5% Cu and 576 g/t Ag over 1.27 meters core length – News Release of March 2, 2018). Drill holes Ky-18-10 to Ky-18-13 were in-fill holes drilled east to slightly southeast at 45 to 57 degree dips. Drill holes Ky-18-14, Ky-18-21 and Ky-18-22 were collared closer to the vein system and at steeper dips (78-83 degrees) to intersect the vein system at a shallower angle to test continuity of mineralization along dip, locate possible ore shoots and gain a structural understanding of the vein’s vertical and horizontal orientations / extensions for targeted follow-up drilling. Hole Ky-18-21, drilled under Ky-18-14, tested the zone deeper. The mineralized intersection at 145.5-147 meters in this hole is the deepest intersection by the Company in the Elmtree 12 vein system and indicates the system is open at depth at this location. This interval also returned anomalous values for cobalt, including 0.07% Co over 1.0 meter core length. 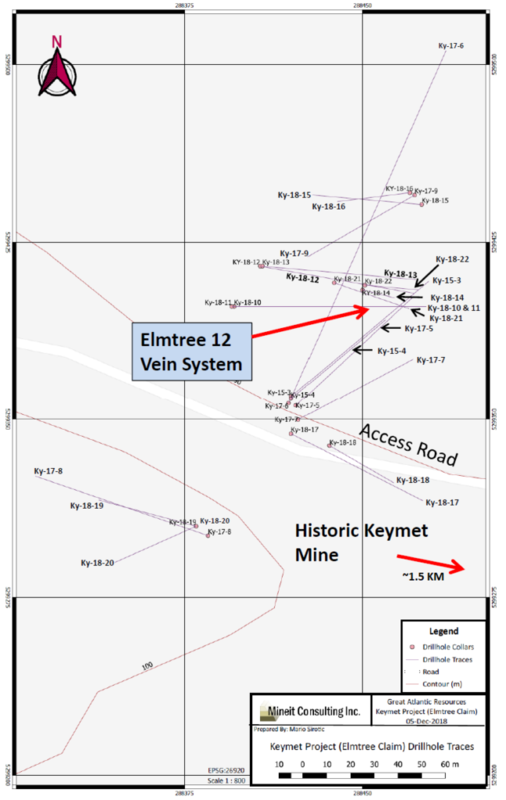 The Company’s focus since acquiring the Keymet Property has been the northwest region of the property in the area of reported polymetallic veins with most work in the area of the Elmtree 12 copper-lead-zinc-silver bearing vein system. At least seven vein occurrences with lead, zinc and +/- copper, silver and gold are reported in this region of the property in addition to the polymetallic veins reported at the historic Keymet Mine (source: New Brunswick Dept. of Energy and Resource Development Mineral Occurrence Database). 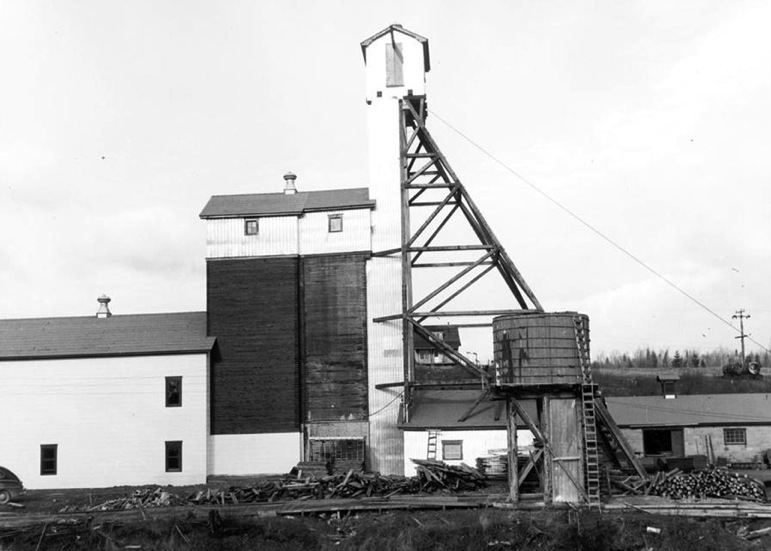 The Keymet Mine operated during the mid-1950s, producing copper, lead, zinc and silver. Production at this mine was terminated due to a fire at the site. Significant precious metal – base metal deposits are reported within 4 km of the Keymet Property. 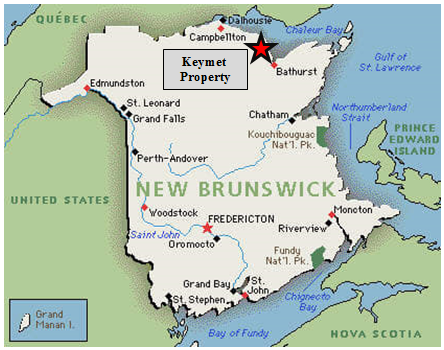 The Elmtree gold deposits are located within 3 km west-southwest of the Keymet Property. The historic Nigadoo River Mine is located approximately 4 km south of the Keymet Property. Polymetallic massive sulfide veins were mined at the Nigadoo River Mine during the 1960s and 1970s with copper, lead, zinc and silver being produced. The N.B Dept. of Energy and Resource Development Mineral Occurrence Database reports shaft depth and production totals at this historic mine. Production during 1967-1971 is reported as 1.126 million tonnes at 2.2% Pb, 2.1% Zn, 0.24% Cu and 92.57 g/t Ag. Production during 1973-1977 (after a 2 year closure) is reported to be 0.733 million tonnes (only partial metal grades reported). The shaft is reported to at least 470 meter deep. Great Atlantic Resources Corp. is a Canadian exploration company focused on the discovery and development of mineral assets in the resource-rich and sovereign risk-free realm of Atlantic Canada, one of the number one mining regions of the world. Great Atlantic is currently surging forward building the company utilizing a Project Generation model, with a special focus on the most critical elements on the planet that are prominent in Atlantic Canada, Antimony, Tungsten and Gold.